I’m a water baby. I celebrate my birthday in the summer month of July and it is my personal mandate to be on/in the water to mark “my day” each year. I also revel in remoteness, the out-of-the-way charm of a not-so-well-known destination. Throw in some tranquility and you’ve got my definition of paradise. Well Happy Birthday to me 2012, because I found it! And hello to Finland’s Archipelago. 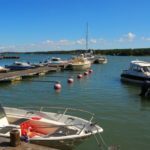 Continue reading WAVEJourney’s Adventure in Finland’s Archipelago to find out why we loved it so much! 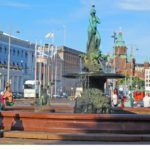 Finland lays claim to the largest archipelago in all of Europe, consisting of the Aland Islands in the autonomous region of Finland and the Turku Archipelago. These islands, skerries and rock formations are in the Archipelago Sea — a part of the Baltic Sea off the southwestern tip of Finland. WAVEJourney spent 3 glorious, fun-filled days in the Turku Archipelago this summer giving us a glimpse of this magical place. 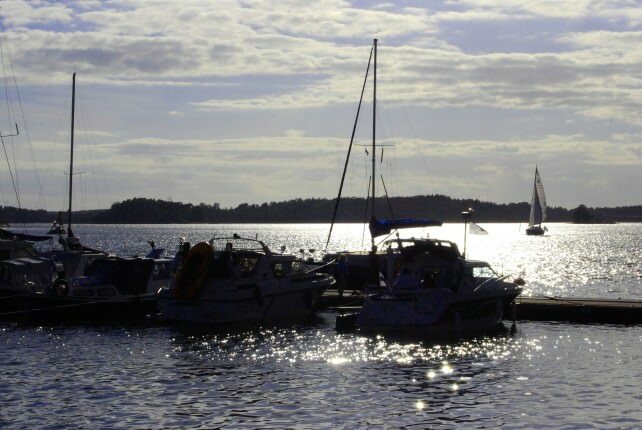 The Turku Archipelago, located off the southwest coast of Finland near the city of Turku, consists of more than 20,000 islands (more than the number of permanent residents in the islands!). Easily accessible by bridges and ferries, The Archipelago is beckoning to those in need of some serious island hopping, biking, hiking or sailing. The Archipelago Trail simplifies your introduction to this unique region. 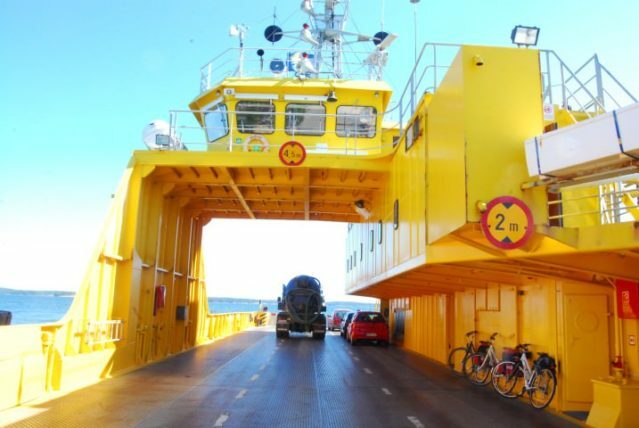 Folks with bikes, motorcycles or cars can experience the islands via eight ferries and a dozen bridges. The ferries depart frequently on the shorter routes and timetables make the logistics simple for routing longer distances. 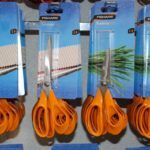 There is a great printed guide for cyclists, as cycling The Archipelago is becoming more and more popular. The guide suggests routes from one day to six days covering up to 124 miles (200 kilometers). 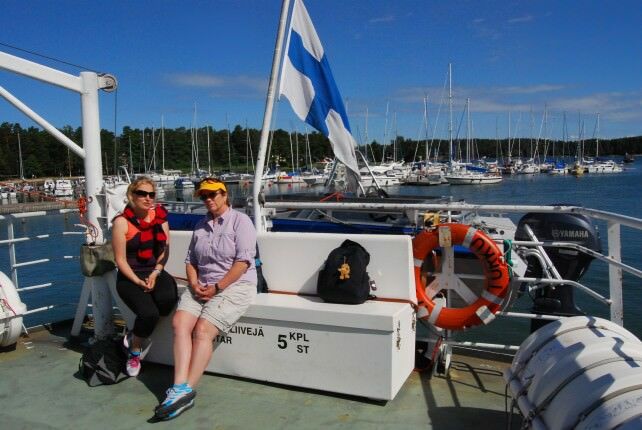 Our Archipelago Adventure started on a Saturday afternoon by leaving Turku (Abo) on the mainland, crossing bridges, driving through Pargas (Parainen), and taking an eight-minute ferry ride to Nagu (Nauvo). Must pause here to explain the place names. 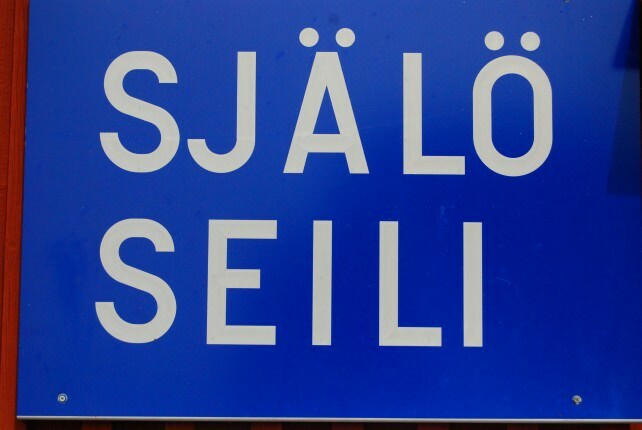 Town names are presented first in Finnish and in parentheses is the Swedish name on the mainland. 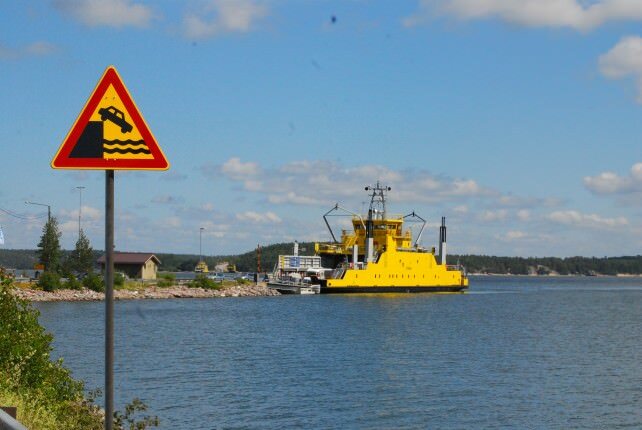 However, throughout The Archipelago, signage and information is presented in both languages with Swedish first, as the Swedish influence is quite strong here and the heritage is honored. 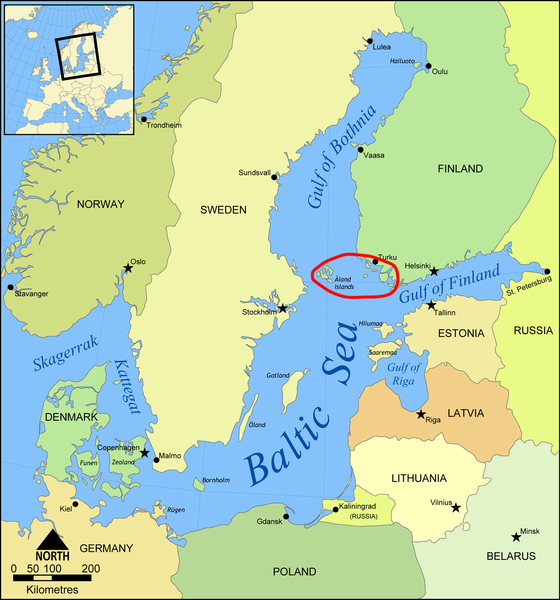 Six per cent of Finland’s population speaks Swedish and many in The Archipelago identify as what I call Swedish Finns. Confused? Don’t be… you’ll get the hang of it. 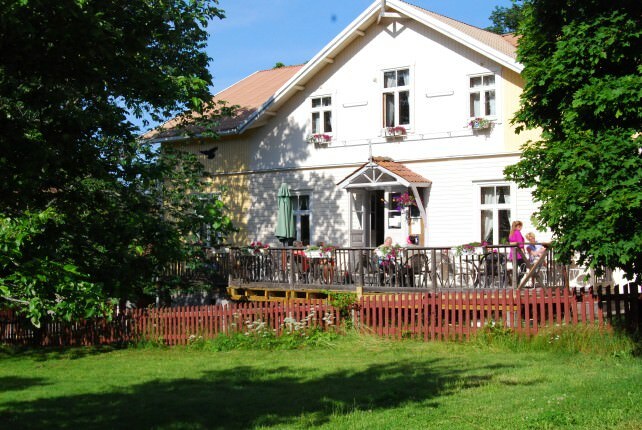 We could not have asked for a more traditional, down-home friendly guest house to welcome us to the islands than Martta’s Inn in Krykbacken on Nagu. 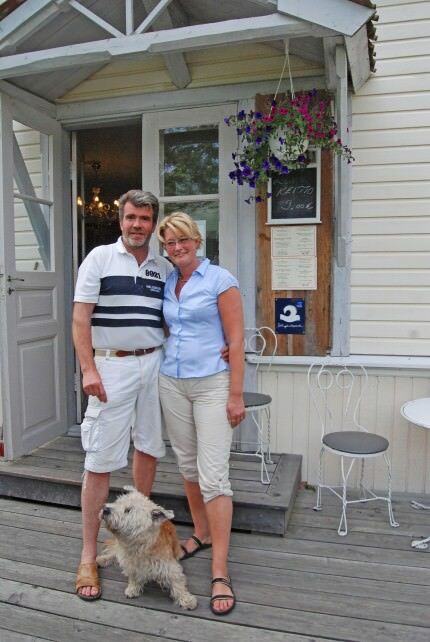 Owned and operated by the husband and wife team of Sture and Sari Nordlin, Martta’s Inn captures the essence of the local flavor and delicious fare. 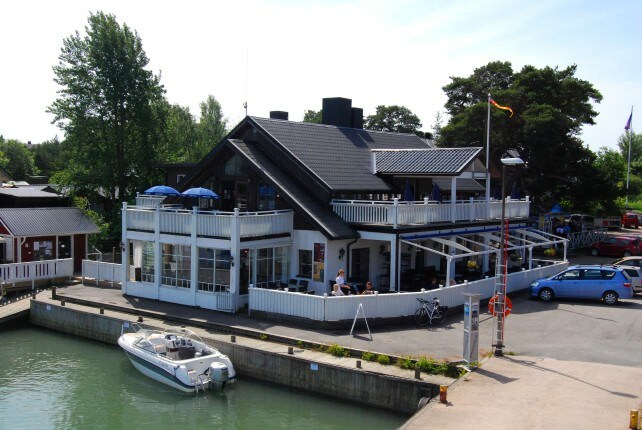 Their charming inn could grace the cover of any travel magazine and is the perfect choice for a stay on Nagu. There was a wedding reception gathered in part of the dining room when we arrived which added to the local character of the scene. 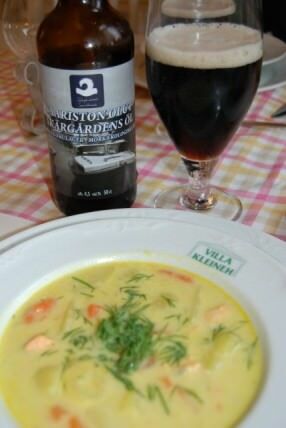 We indulged on the fish buffet and partook of a regional dark beer (Saariston Olut Skargardens Ol). Here we also immersed ourselves in our inaugural Finnish sauna experience. Martta’s Inn features a true Finnish sauna replete with a stack of young birch branches at the entry. We picked up a few branches which we used as a whisk to lightly hit ourselves while luxuriating in the sauna steam. This technique both exfoliates and relaxes as nature’s own body scrub. Sture made sure we had a couple of those tasty dark beers along for the experience. Archipelago bread, which is to die for, complemented our breakfast of yogurt and muesli. Sunlight streamed into the old fashioned, antique-decorated dining room at Martta’s. Our lovely hosts were but the first example of the extraordinarily friendly people we were to meet on the islands. Actually it has been documented that Finns are some of the most happy people on earth and I can’t argue with that! Once fortified for the morning, we headed out for our day’s adventure. 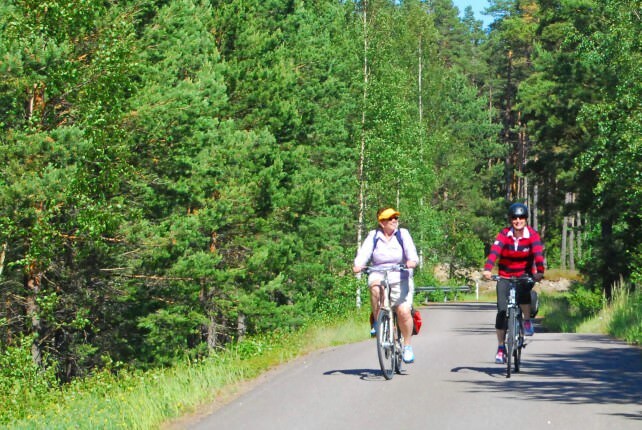 First on our list was a leisurely bike ride around Krykbacken. The village is small and we enjoyed cruising carefree on our bikes and breathing in the morning scent of the maritime fresh air. 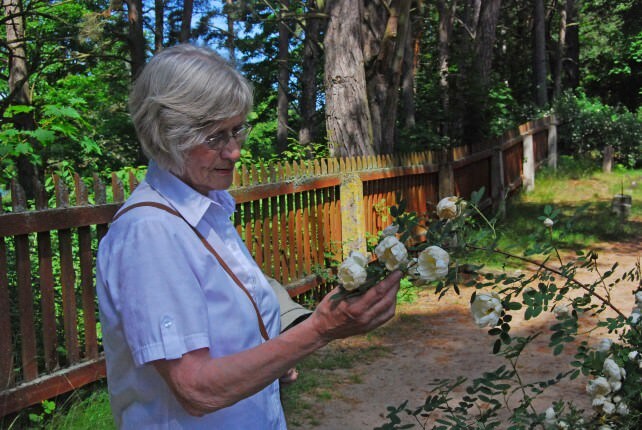 We toured St. Olof’s Church, the shops along the harbor and the labyrinth of the maiden’s dance. Next on our agenda, we met our tour guide, Rauni Schleutker, at the small boat harbor to board the ferry, M/S Ostern. 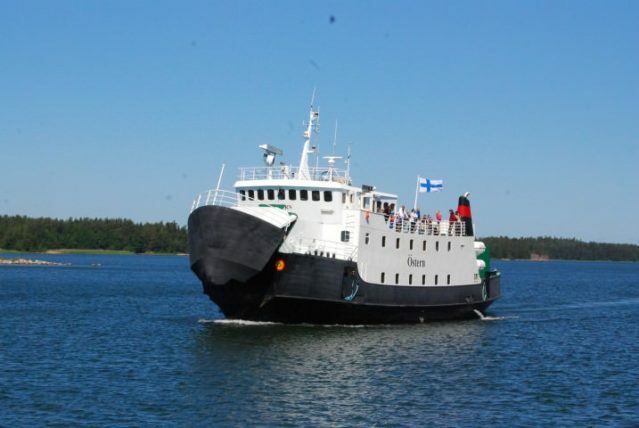 This ship’s capacity allows for up to 130 passengers and 17 cars. We set sail for Seili, a 25-minute ferry ride winding through islands in this watery playground. Calm waters made for a relaxing and tranquil passage. 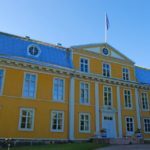 The island of Seili is home to University of Turku Archipelago Research Institute. However, its history as the site of a former leper hospital and later an insane asylum marks its haunting past. Nonetheless, it is now a lovely island to bike around or stroll. 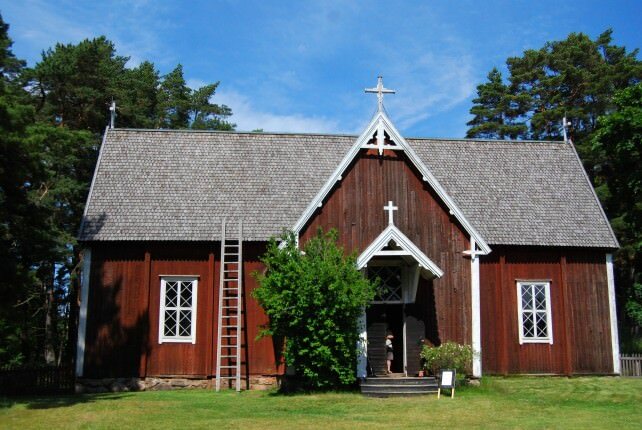 There is an old wooden church to tour and a small snack hut on the far side of the island. We smiled at the Frontier Guard (coast guard) eating ice cream cones here on a break from their duties. Once back at Martta’s we didn’t waste anytime grabbing a couple of beers, birch branches and hitting the sauna. Absolutely divine. It is easy to see why Finns seem to have so much vitality… it is in the steam! We dined at L’escale, sitting upstairs just inside from the terrace. We overlooked the guest harbor, watching all activity by the sea. This french-themed restaurant was clearly popular with the locals, which is always a good sign. Both dishes, pepper steak and local fish, were exquisitely prepared and thoroughly enjoyed. After wandering along the harbor area and checking out boats, we called it a day. Another kick-start to the day thanks to Archipelago bread and a bowlful of yummy porridge. Today was our Biking Day and we were ready to ride! 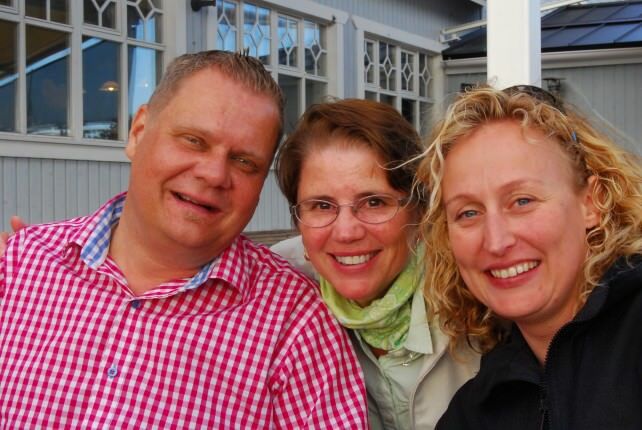 What a delight to meet our guide, Ulrika Ström, who works with the team promoting tourism in The Archipelago. 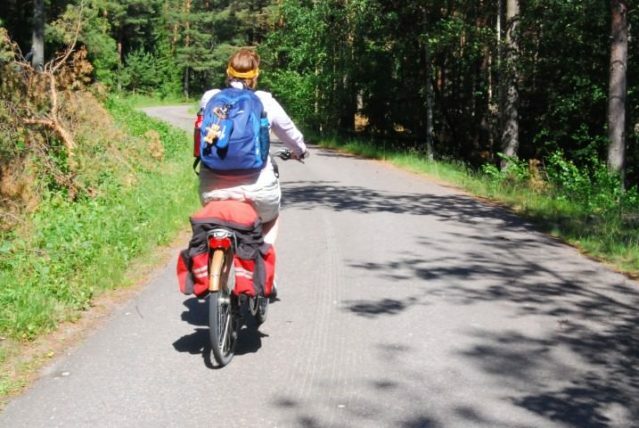 Ulrika, lean and fit, was the perfect ambassador to share her knowledge of the islands and the bicycle routes with us. Once again, we started our day’s journey by hopping on a ferry. We rolled our bikes right on board. Basking in the long rays of the Scandinavian sun, we sat topside on the 2-plus hour ferry ride to Norrskata. Islands, ranging in size from large rock formations to land masses with guest houses, dotted our route. Sailboats skimmed the surface of these calm waters. The views epitomized the concept of idyllic island life tucked away among picturesque islands. Upon docking at Lavarn Harbor in Houtsala we chowed down on fried herring and salmon soup at Lavarin Paviljonki,a seaside restaurant. 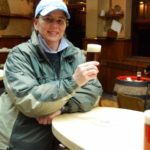 I was shocked when the waitress told me that I was the first American she had ever spoken to. Talk about the charm of a not-so-well-known destination! Ulrika showed us around this tiny harbor hamlet and we visited with some of the locals. We were even invited into one home. 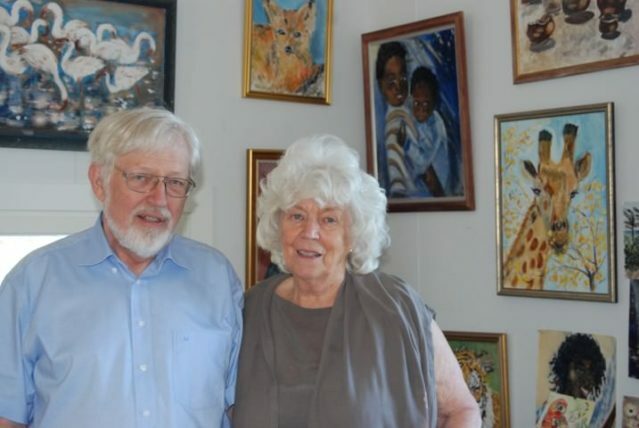 Here the artist, Carita Hellström, showed off her work while her husband, a retired doctor, played a piano piece for us. Finally, it was time to do some serious cycling. We rode for miles with nary a car in sight. 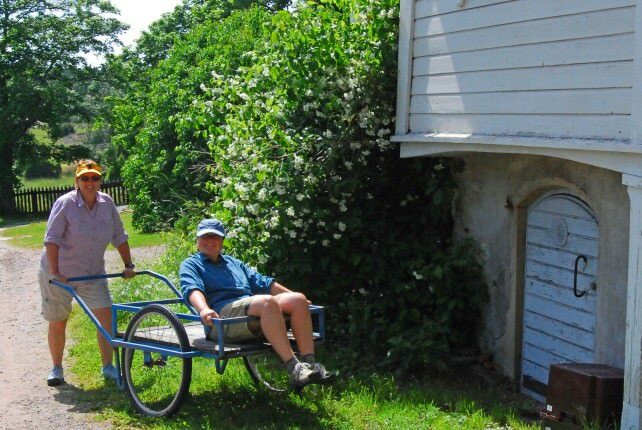 Perfect pedaling in a storybook setting. 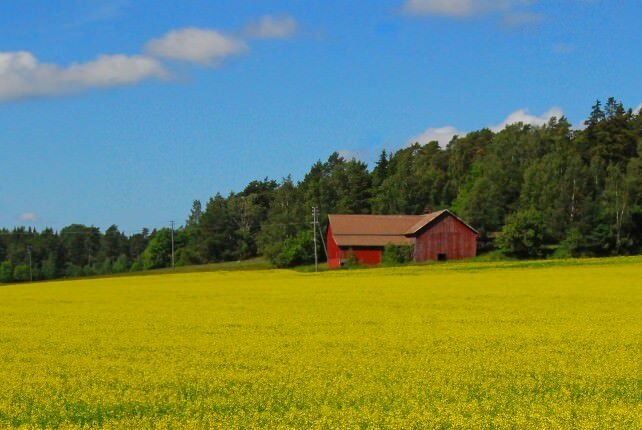 Fields and forests lined our roadway and we biked with grins on our faces. We took one rest along a strip of beach and soaked in the uniquely stunning atmosphere of the archipelago. A snake wiggled through the rocks nearby. It was time for us to wiggle our way along, too. We rode awhile longer reaching the southern tip of the island and waited only a few minutes for a ferry to take us to our next stop. Only 15 minutes or so later, we were on Korpo (Korppoo) and we saddled up and carried on to our B&B for the night. 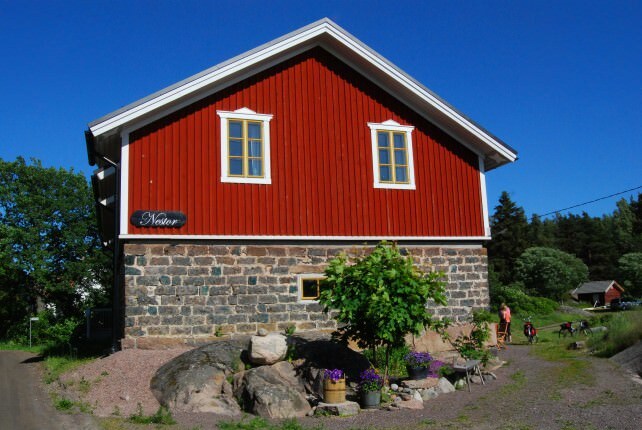 Hotel Nestor is an old barn that has been renovated by the owners — artist Pia Rousku and designer Frank Hellgren. Staying here in this traditional setting surrounded by Mother Nature was a perfect place to call home for an evening after a day of exploring by bike and ferry. Hotel Nestor has been refurbished with clean lines with comfort and culture a priority. 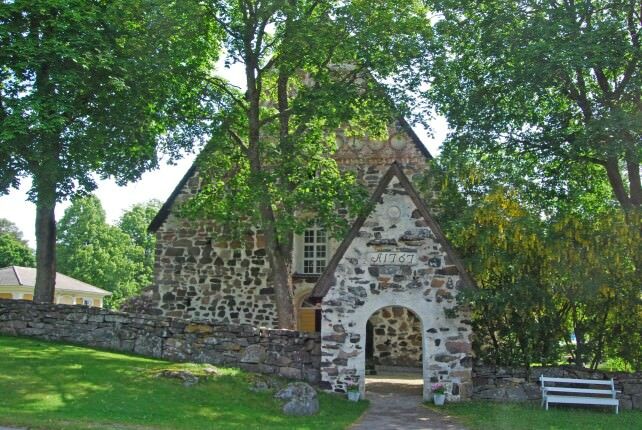 The former stable built of slag stone now serves as an art gallery and conference room. Alas, the night was still young and it was time to check out the village. We had the distinct pleasure of being joined by Niclas Gestranius, the marketing manager for tourism in the area. This man is a ball of energy and truly loves his job. His enthusiasm kept the evening lively as we dined at a local favorite, Restaurant Buffalo. Buffalo is situated alongside Guest Harbor Verkan… it is difficult to NOT dine seaside in this part of the world! Another meal of delectable local specialties. I savored the bleu cheese steak and sampled the 15-spices ribs. Of course local refers to libations, as well… so Jalovina (Finnish liquor) toasts for my birthday were appropriate! Our hosts at Hotel Nestor provided a simple, tasty breakfast to send us on our away. We, along with Niclas and Ulrika, packed up and said our goodbyes. We popped in at Niclas’s house for a tour and a champagne farewell before heading back to Nagu. By now, catching a ferry was old hat and we made our way back to Martta’s Inn and picked up our rental car. One last stop was made at Vastergard B& B to thank the owner, Tom Carling, for providing our bicycles. 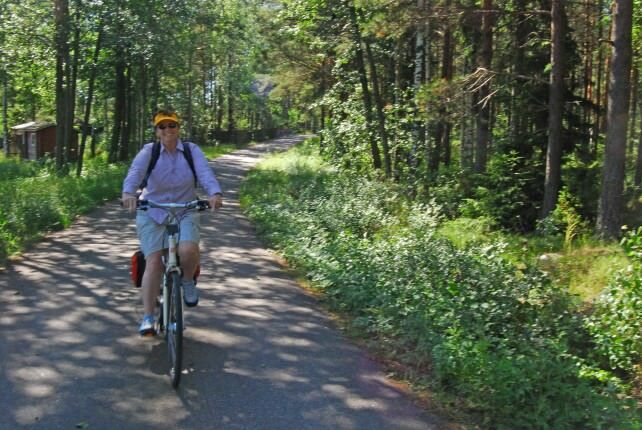 He is a terrific resource for planning a bicycle trip around The Archipelago, bicycle rental and accommodation. Finns love life and love sharing their life. They have a generosity of spirit that is simply amazing. The Archipelago is a hidden gem waiting to be discovered by all who want to secret away to a tranquil place surrounded by the beauty of the sea and the compelling nature of the islands. Water baby or not, put Finland on your radar and let the magic begin.